Which are the biggest Amish tourism areas? What can visitors to “Amish Country” do? Any tips for visiting the Amish? Where can I find Amish tourism info? Which are the biggest Amish tourist areas? Lancaster County receives significantly more tourists than any other Amish area, with estimates of around eight million visitors per year, generating about $2 billion of economic activity. This is unsurprising given the community’s size, age, prominence in the media, and proximity to large East Coast population centers. Interestingly, in 1955 Lancaster County, tourism was a comparatively scant 25,000 visitors, though it was considered substantial at the time. Other top tourism destinations are Holmes County, Ohio, and the northern Indiana community of Elkhart and Lagrange Counties (sometimes referred to by the name of the town of Shipshewana). Amish and related activities form the centerpiece to tourism promotion in many communities. Modest Amish-themed tourist industries can be found in other Amish-populated areas in Illinois, Tennessee, Minnesota, New York, Missouri, and other states. Do Amish like tourists? It depends on who you ask. Some Amish make a living from tourism. Some enjoy meeting visitors from other places. Others dislike the traffic and unwanted attention. Some try to be charitable to tourists, recognizing that they may have honest curiosity and that an encounter with a tourist may be a way to offer a Christian witness. Read more about pluses and minuses of tourism from an Amish perspective. Buggy rides are popular activities for tourists. They may be guided by an Amish person. 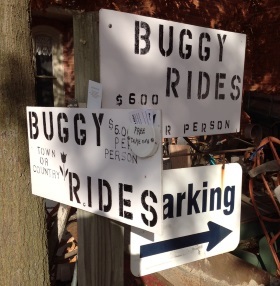 Lancaster County, PA.
What can visitors to “Amish Country” do? Some visitors enjoy eating at Pennsylvania Dutch or Amish-style restaurants or taking part in activities such as buggy rides (often accompanied by an Amish driver/guide), or visiting attractions which simulate or represent the Amish lifestyle. One recommended way to interact with Amish people is to patronize an Amish business. These include roadside produce stands, bakeries, furniture stores, craft shops, harness and tack shops, and others. Any tips for visiting the Amish? Amish appreciate modesty in dress, so try to dress accordingly. Visit a roadside stand or country store for food products such as canned goods, baked goods, or other items. Drive safely – buggies typically travel at less than 10 miles/hour. In many Amish communities there are hills, curves, and other obstacles that obstruct views and create potential accident situations. You will be surprised at how quickly your car overtakes Amish buggies on the road. Enjoy your visit and remember that Amish people are not museum exhibits but are people too, and appreciate a good conversation, joke, or thoughtful comment like any other person would. Where can I find helpful info on Amish tourism? There are many commercial websites devoted to tourist activities in most areas with significant Amish tourism. These include discoverlancaster.com, visitamishcountry.com (Holmes County, Ohio), and amishcountry.org (northern Indiana). To locate Amish businesses and establishments selling Amish products, you can search our online Amish business listings. Weaver-Zercher, David. The Amish in the American Imagination. Baltimore: Johns Hopkins University Press, 2001. Trollinger, Susan L. Selling the Amish: The Tourism of Nostalgia. Young Center Books in Anabaptists and Pietist Studies Series. Baltimore: Johns Hopkins University Press, 2012. Amish Country.org. Elkhart County Convention & Visitors Bureau. Web. 10 Mar. 2015. <http://www.amishcountry.org/>. Discover Lancaster. Discover Lancaster Visitors Center. Web. 10 Mar. 2015. <http://www.discoverlancaster.com/>. Discover Geauga County. Destination Geauga. Web. 10 Mar. 2015. <http://www.tourgeauga.com/>. Amish Country Ohio. Holmes County Chamber of Commerce. Web. 10 Mar. 2015. <http://www.visitamishcountry.com/>. To Cite this Page: Wesner, Erik J. 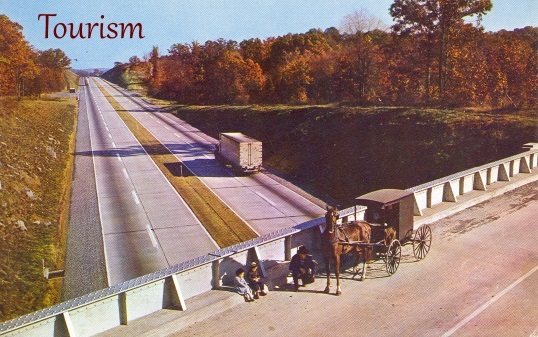 “Tourism.” Amish America. Erik Wesner, 10 Apr. 2015. Web. [Date Accessed]. <http://amishamerica.com/tourism/>.